This is another one of the photos I was challenged to take – it turns out that taking a really interesting photo of the moon is hard, as it frequently turns out to ‘just’ be ‘the moon’. 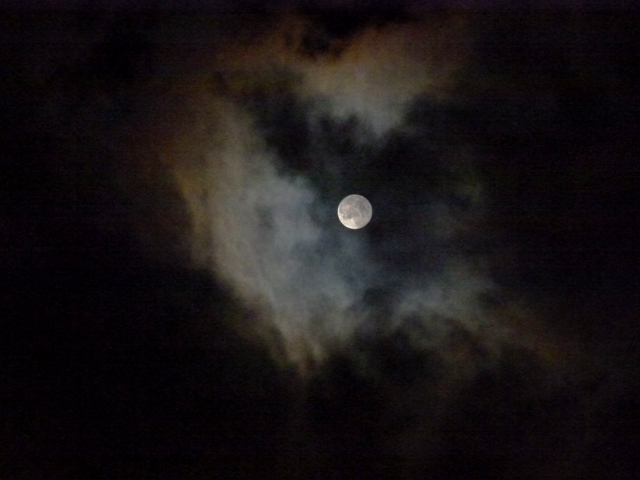 But tonight the clouds were cooperative, and so here’s my fill for “the moon/interesting”. This entry was posted on Saturday, September 1st, 2012 at 00:10	and is filed under my photography, photos: challenge replies. You can follow any responses to this entry through the RSS 2.0 feed. You can leave a response, or trackback from your own site. It looks like batman shadow is falling over the moon. Great photo, thanks for the wonder. so fantastic the photos you took that deeply attracted me !